Keith Curle believes all the pressure is on visitors Colchester United ahead of Saturday’s Sky Bet League Two clash at the PTS Academy Stadium (ko 3pm). The Cobblers are still in bother at the wrong end of the table as they sit just seven points above second-from-bottom Macclesfield, while the U’s come to town in eighth place, four points outside the play-off positions. If anything, the pressure is on Colchester. They have just slipped out of the play-offs and will be desperate to try to get back in there. The Essex side’s promotion hopes have taken a hit in recent weeks as they have won just one of their past seven games, dropping 16 points out of a possible 21. And Curle, who is relaxed about Town’s position in the table, says John McGreal’s side will be desperate to get themselves back in the top six running. “If anything, the pressure is on Colchester,” said the Cobblers boss. “They have just slipped out of the play-offs and will be desperate to try to get back in there. “They start games very well and it is important we meet that challenge head on, but there is nothing to be scared of and there is no fear factor in our changing room. “We know we can score goals and we need to take advantage of the goalscoring opportunities we get. Town go into the game looking to protect an unbeaten home record in league two that stretches back to September 8 when Cheltenham recorded a 3-1 victory. The Cobblers haven’t lost in their past 11 league matches at the PTS, but the issue has been the fact they have drawn five of their past six at home, including last Saturday’s 1-1 draw with Morecambe. 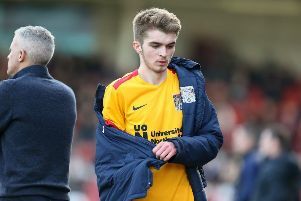 In several of those matches, including against the Shrimps, the Cobblers have led only to be pegged back, and Curle admits there have been too many ‘missed opportunities’. But he believes the team will soon start to get their rewards. “If you have a look back over the past eight or nine games, there have been missed opportunities to gain all three points,” said Curle, who has also seen the Cobblers suffer last-gasp defeats on the road at Cambridge United and Forest Green Rovers since the turn of the year. “It is something we are managing, something we are dealing with, but it is not the be all and end all. “The focus is on starting games well, then getting that second goal,starting the second half well and facing challenges and accepting challenges. Curle’s selection options are boosted this weekend by the arrival of deadline day loan signings Marvin Sordell and Charlie Goode, and the Cobblers could also welcome back some of the players who have been missing recently through injury. John-Joe O’Toole, Sam Foley, Shaun McWilliams and Dean Bowditch are all on the mend and could be available. Left-back George Cox, on loan from Brighton, definitely misses out after suffering an ankle ligament injury at the Abbey Stadium two weeks ago.